September 11th, 2013 - Just one final nail remains to be hammered into place before Dean Saglio seals Donkey Kong's coffin once and for all. 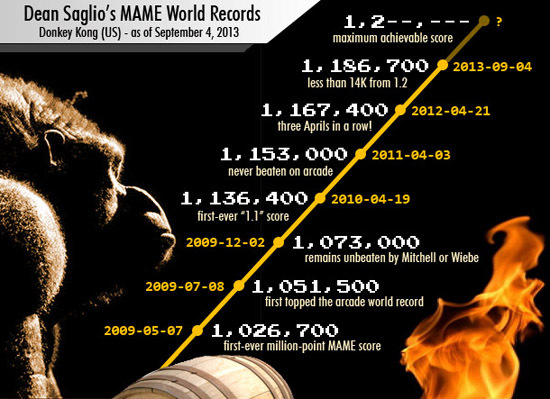 On September 4th, Saglio topped the MAME world record for the seventh time in a row, the latest step in a journey of unprecedented high score triumphs that began half a decade ago. The top score on original arcade hardware—the only score recognized as the official Donkey Kong world record by the media and the public—has actually trailed Saglio's MAME scores since July 8th 2009, the day that Saglio beat the arcade record Billy Mitchell achieved in 2007 (soon after the release of the King of Kong). Since that day, while the arcade machine record has risen significantly and changed hands multiple times between Mitchell, Steve Wiebe, and Hank Chien, Saglio has never lost the overall lead. While his top scores only exist in the "parallel universe" of MAME, all but the most ardent purists within the classic arcade community have long recognized Saglio as the true King of Kong. The game is, after all, emulated perfectly in MAME, and Saglio has demonstrated repeatedly that his skills transfer almost seamlessly to an arcade cabinet. His best game during the Kong Off 2 instantly placed him near the top of the arcade scoreboard. The platform divide notwithstanding, in a community of hundreds of players, and where more than a dozen top contenders battle one another for inches, Saglio has been playing in a class all by himself since soon after he debuted on the scene, consistently performing at a level years beyond the competition. Hank Chien's latest arcade world record in November 2012 came within 30,000 points of Saglio's top MAME score, but Wednesday's game widens the gap to almost 50,000 (and quite possibly beyond the physical capacity of arcade controls, which may not be able to compete with the precision of a keyboard). All that remains now is for Saglio to close the deal and break the "1.2" barrier, which will constitute the absolute maximum humanly-achievable score and (by necessity) his retirement from the high score quest. "Eleven Eighty Five... If I Don't Totally Fall Apart"
Wednesday's game was long in the making, the culmination of 17 months of on-again/off-again attempts. Saglio had actually come close on a few occasions, playing at, and even beyond, 1,200,000 pace deep into the upper levels before poor luck brought those runs to a premature end. "It's hard to explain what exactly happens when you become fatigued during these types of games, but it becomes a very serious challenge that you just try to push through as best as you can without dying and that often results in a small decline in the scoring pace." It wasn't until the final level, which he entered on his last life, that Saglio predicted 1,185,000 as his final score, "if", he said on the live stream "I don't totally fall apart." Shaky control, and a bit of shallow breathing, suggested that he might. The game's final boards were forgiving, however. Saglio reached the kill screen without incident, and completed the game just a tad higher than his estimate. More than 150 viewers had flooded into Saglio's Twitch.tv channel over the final few levels to watch gaming history unfold, and a shower of congratulations cascaded through the chat as he entered his initials. "That was stressful," Saglio said simply, unconsciously echoing the exact words that he had used at the end of his previous world record run. "I'm exhausted." There is nowhere for Saglio to go from here except straight to 1,200,000—the Holy Grail of Donkey Kong scores. It won't happen right away, as Saglio is "looking forward to at least a small break from this game," a break that he seems to be enjoying with casual runs at other titles. And don't expect this latest breakthrough to appear on the Twin Galaxies MAME scoreboard. The score will remain "unofficial" for the foreseeable future. Saglio, while generally supportive of the recently-restructured organization, has been vocal in his opposition to TG's new fee-based submission structure, and will limit this submission to alternate scorekeeping entity MAME Action Replay. 1.2 is a certainty. It might be months, perhaps even a year or more, before Saglio achieves it, and it will be a day of both celebration and funeral. Until then, the game's best player will continue to inspire the rest of us to brave the raging tide of fire and barrels with the Saglio war whoop that has become familiar to us all: "big, big, big!"